Alumina or aluminium oxide is one of the most widely used and versatile engineering ceramics and is employed in a wide variety of applications. It finds use in industrial applications in purities ranging from 60 to >99+%. Its wide industrial acceptance means that there are many manufacturers around the world who produce alumina ceramic materials, however, only a precious few are able to produce high purity alumina engineering ceramic components to tight tolerances that truly exploit its chemical, mechanical (wear) and electrical properties. Table 1. Alumina – Facts at a glance. While chemical properties are directly proportional to purity, physical properties such as strength, facture toughness and wear resistance are achieved by producing a fully dense structure with uniform fine-grained microstructure. Alumina is used in a range of applications in a wide range of industries. Some of these are summarised in table 2. Alumina is often used to replace metal components due to its superior wear and corrosion resistance. However, retrofitting alumina is not always as simple as a direct replacement. 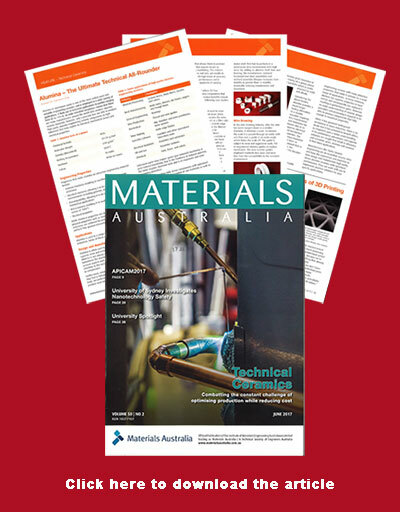 Sometimes the alumina part must be re-engineered to take into account aspects such as stress distributions, paying particular attention to the fact that metals are good in tension and ceramics in compression. Furthermore, ceramic production typically incorporates a forming step that is followed by sintering to produce a coherent, dense body. An understanding of shrinkage is typically required to produce near nett shapes. To achieve required dimensional tolerances parts may require green (pre-sintered) machining or post-sintered machining. Due to the hardness of sintered alumina, the latter requires diamond tools and is an expensive and time-consuming procedure. Furthermore, to produce fully dense components with optimised microstructures requires careful control of raw materials as well as the entire production process. Alumina occurs naturally in nature in single crystal forms such as sapphire and emery. These have value as gemstones and a limited number of industrial applications e.g. sapphire is used in optics and as a substrate. Industrial alumina is sourced from Bauxite. Australia is the largest bauxite producer in the world, accounting for over 30% of the global production (according to 2012 figures). Weipa in Queensland is the most significant bauxite deposit (3000 million tonnes (Mt)) . Other deposits are located in Gove in the Northern Territory (>200Mt) and Darling Range, Mitchell Plateau and Cape Bouganville in Western Australia (>500Mt each). Alumina is extracted from bauxite using a wet chemical process called the Bayer Process. According the Geoscience Australia, 85% of alumina produced goes into aluminium production and 10% goes to specialty alumina. In Australia there have been a number of manufacturers who have produced high purity alumina ceramics over the last 40 years. 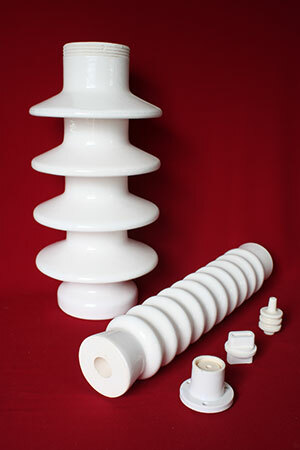 During this period, one company has stood the test of time, Taylor Ceramic Engineering (TCE). They were one of pioneers of alumina ceramics in Australia and have continued to grow as other have risen and fallen. Founded by David and Julie Taylor in 1967, TCE originally manufactured bonsai pots. In the mid 70’s David’s inquisitive nature lead him to start manufacturing alumina ceramics. Over the next 10 years TCE grew in both expertise and reputation to become a global supplier from their plant in the Sydney suburb of Rockdale. David and Julie become mainstays of the Australian ceramic scene throughout the 80’s and 90’s and were synonymous with advanced ceramics in Australia. During this time David amassed a vast wealth of ceramic knowledge which he passed on to his daughter Alyssa. His infectious enthusiasm lead her to study Ceramic Engineering at UNSW. Together they continued to develop and refine their technology to be able to produce some of the finest and highest performance alumina available as well as host of other specialty products. To this day TCE remains proudly and wholly Australian owned and uses only Australian sourced raw materials. While they specialise in high purity alumina ceramics, they can tailor compositions to suit specific applications and are able to re-engineer components to maximise the performance of their materials. Amongst their claims to fame are the fact that they developed the first ceramic knee prosthesis in the 1980’s, an example of this component now resides in the Powerhouse Museum in Sydney. This lead to other biomedical implants including hip and shoulder prostheses. Other high tech achievements include supplying parts to isolate sections of the plasma engine in space shuttle projects. They also re-engineered tiles for the Opera House that incorporated a custom fixing design and composition to match the colour of the original tiles and to increase the original strength and longevity. They also devised a unique nett forming technology that allows them to produce components that require no pre or post-sintering machining. This reduces production time and cost, yet results in components with high levels of accuracy with optimised performance and is applicable to components of varying complexities. Some examples of where TCE has manufactured alumina components that have brought performance benefits include those outlined in the following case studies. A key piece of equipment used in wine making is a rotary vacuum drum (RVD) which has a filter that separates the wine from the solids collecting as a filter cake on the outside of the drum. A knife edge blade is then used to remove the filtered debris so that the process can be continuous. It has historically been manufactured with a tungsten carbide or stellite tip, but wine makers have been replacing their standard blade with an alumina blade from TCE. This resulted in immediate benefits allowing them to run for three seasons (24 hrs a day for 4 months ~ 8000 hours), which was more than six times the life of the tungsten carbide component lasting only half a season (approx 1000 hours) before sharpening is required. Apart from the efficiency gains, the big benefit was that the alumina blade was half the price and it is chemically inert to food, eliminating the possibility of dissolved metal in the wine vintage which can potentially taint the taste. The brick industry for the most part runs 24/7 as a continuous process to keep prices down in a competitive market place. TCE re-engineered a bearing and shaft assembly that comprised a hardened metal shaft that had to perform in a notoriously dirty environment with high wear. By adding an alumina shaft liner and bearing, the manufacturer replaced hardened tool steel assemblies and realised assembly lifespan increases from months to greater than 12 months, drastically reducing maintenance and downtime. In the wire drawing industry, after the wire has been swaged down to a smaller diameter, it develops a scale. To remove the scale it is passed through an acidic bath and then over a guide at an acute angle which flakes the scale off. The guide is subject to wear and aggressive acids. TCE re-engineered alumina guides to replace metal ones. The new ceramic guides displayed markedly less wear and were free from the susceptibility to the corrosive environment. Has a 2.6 times lower loss factor Tan d (too high a Tan d can lead to excessive heating brought about by the incoming active power and thus to a shorter life time of the insulator). Has a dielectric constant of approx 1.6 times higher than Steatite (the dielectric constant affects how electronic signals move through the material; a high dielectric constant means the energy travels more slowly through the material). Has a higher Dielectric Strength (the value at which the insulator, when placed in an electric field will lose its insulating properties if the field exceeds a certain critical value). Has a lower dielectric loss (which is the proportion of energy lost as heat; the lower the dielectric loss the more effective the insulator). Has 2.5 times tensile strength and 3.6 times compressive strength (which is necessary in high stress applications such as brake grid insulators for trains). Has extremely high resistance to chemical attack due to its strong alumina-alumina grain boundary in contrast to relying on a glassy phase bonding the particles which is easily attacked by acids and alkalis. 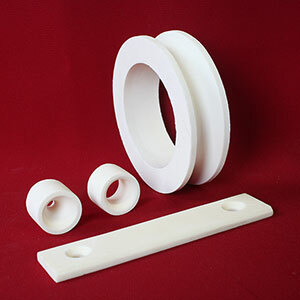 Alumina is a high performance, versatile engineering ceramic with many attractive properties that make it suitable for a wide range of applications. In many instances, it is superior to hard metals, however, an acute understanding of ceramic design principles and processing is required to be able to produce components that fully exploit its beneficial properties. While it has garnered widespread acceptance in many industries, there is no doubt that it has potential to benefit others. As engineers gain a better understanding of its performance advantages and superior solutions are sought that result in efficiency and economic gains, alumina will continue to find more applications. 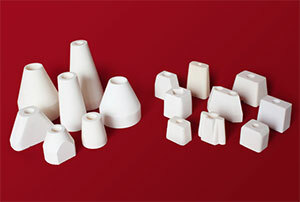 Manufacturers like Taylor Ceramic Engineering are an Australian success story and have the experience and expertise to both design and manufacture high purity, dense alumina ceramics with optimised performance. 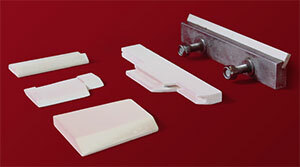 They can work with you to implement alumina solutions for your specific applications.